Even the most skilled worker will admit that construction sites can be dangerous. Various tasks may be taking place at the same time, often being performed by different crews. Heavy equipment and materials that could be hazardous on their own are all being used by workers whose experience may range from extensive to none at all. Not surprisingly, established safety standards are frequently overlooked. If you have been injured in a construction accident or if someone you care about has suffered a job injury, contact the Naples personal injury trial lawyers at the law offices of Friedman, Rodman & Frank, P.A. We will do everything we can to achieve the best possible results for you. Construction accidents can result in injuries of all types, including brain and head injuries, paralysis, loss of limb, back injuries, loss of vision, broken bones or, in the most extreme cases, wrongful death. Injured Florida construction workers are entitled to workers' compensation. This covers lost income and medical bills. Victims may also be eligible for lifetime permanent disability payments and lump sum settlements in some cases. 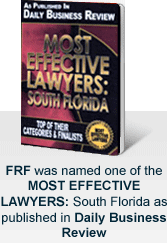 We help workers throughout Florida file workers' compensation claims to receive this compensation. Of course, our goal is to maximize the compensation you receive. This means looking at every valid legal claim that can be brought. In construction accident cases, we frequently file personal injury claims against contractors, subcontractors, vendors and other parties. This is in addition to the workers' compensation claim. Call us toll free at 877-448-8585 or contact us online to speak directly with a Naples construction accident attorney in English, Spanish or Creole. Se habla español/Nou parlé Creole. We are available to assist you 24/7.